The potential to sink lower than the animals and rise higher than the angels. The first human ever to walk the earth was named Adam. The Torah explains the name. The Hebrew word for earth is adama. God formed man from the dust of the earth, and on the simplest level, that connection with adama, earth, is the basis for man’s name. Once Adam sinned and ate the forbidden fruit, he introduced death to the world and was sentenced to once again return to the earth from which God created him. The mystics pointed to various deeper meanings within the name Adam, providing layers of insight that can make our own existence more meaningful. The name Adam does indicate one’s lower earthly nature. But are we really nothing more than the complicated mammals? In addition to the adama being a low place in the world, there is another aspect of the adama which is perhaps its defining feature. The earth is a realm in which we can plant and yield fruits, giving rise to new life which was not there beforehand. Man’s kinship with the ground, therefore, hints to his greatest potential. Man’s kinship with the ground hints to his greatest potential. Before creating Adam, God said, “Let us make man” in the plural. With whom could God possibly partner when creating humankind? According to one approach, He consulted with His ministering angels and asked them what they thought about creating man. A fierce debate ensued. The whole dialogue in the heavens appears bizarre at first glance. Why did God need to consult with His angels before creating man? Why did He reject truth in order to create Adam? Were the angels negotiating with Him? How did they convince Him to revive the angel of truth? Did He really change His mind? A core tenet of Jewish consciousness is that when the rabbis tell stories like this one, they really mean to convey a deeper message hidden deep within the parable. The Maharal of Prague explained that throwing truth to the ground was by no means a rejection of truth. It was an investment in truth. The proof is in the verse our Sages used to explain the revival of truth: “truth shall grow from the ground.” God never rejected truth; instead He planted in the ground. The metaphor of the ground and its centrality in man’s name is no coincidence. The simple act of planting a seed is a powerful symbol of man’s potential. Recall that day in kindergarten where you might have planted a bean in a plastic cup so that it would grow into a plant for Mother’s Day. Every day you checked to see whether anything had grown. At first, you were disappointed as you watched the seed. It looked like it was falling apart and rotting. You wanted to throw it out, but your teacher insisted that you wait. One day, a green shoot appeared from amidst the smelly decay. It continued to grow and grow, until there was a beautiful leafy plant, with the potential for an infinite number of new plants. Therein lies the secret of God’s sowing truth. There is a very physical side to every human, and often it brings us to places of rot and decay, places in which we can wreak more havoc on creation than the most destructive animal. Yet we also have the ability to transcend that downward pull and grow from the earth into something greater with almost unlimited potential. There were angels that opposed man’s creation. The angel representing truth argued that humans lie, and they have the potential to destroy the world. In contrast, angels are perfect. An angel is the manifestation of God’s will, and is completely unable to deviate even an iota from that will. An angel has a name that reflects its mission since that is all the angel is. Angels cannot choose to disobey and have no minds of their own. Like the ground, man can produce a virtually unlimited bounty of fruits. Humans, however, have free choice. Every person has the ability to decompose and succumb to the earthly pull, or to defy the gravity of physicality and elect to follow more spiritual pursuits. Like the ground, man can produce a virtually unlimited bounty of fruits. Man’s decision to live on a higher plane is infinitely more meaningful than an angel’s spiritual existence since it is the result of man’s choice and rejection of his lower self, or his channeling it to a higher place. We all have ups and downs, but we can choose the realm with which we most identify and whether or not we will bounce back after we have fallen. The name Adam alludes to man’s ability to transcend on an even deeper level. The word Adam is comprised of the letter aleph, followed by dalet and mem, the letters that spell the word dam which means blood. We need blood to sustain physical life, but it reflects the lower aspects of man. Blood has long been associated with hot temperament and loss of self control. Shakespeare described one of his quick tempered characters as “governed by a spleen,” an internal organ containing a reservoir of blood. The lowest aspect of one’s soul, an aspect of soul common to every animal, resides in one’s blood. 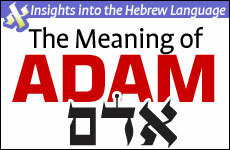 In the name Adam, the word dam is preceded by the letter aleph. The letter aleph is also a word which means to teach or inculcate. It similarly indicates leadership, as implied by the related word aluf which means a general or tribal head. God created man with many base desires that reside in the blood, but he also gave us the means to assert our control over them and be an aluf over the dam. By being in control instead of subject to the dominion of our impulses, man, who is created in the image of God, resembles God. In this connection, the name Adam also alludes to the word adameh which means I will liken myself, indicating one’s ability to emulate God. Adam himself represented man’s colossal potential, as well as how far he could fall. Adam’s understanding of the world was vast, and his dominion complete until he ate from the forbidden fruit. God created Adam to be immortal, something that remains true of the soul, but not of the body. Adam himself succumbed to the dam in his name, and failed to rule over his inclination. He introduced death into the world, something which had not applied to human beings before that point in time. Yet although he shrank in stature, elements of the higher Adam, the potential for accomplishing greatness, remained. Adam lived for 930 years. Our Sages explained that he really should have lived for a complete millennium, but he willingly gave up 70 years of his life to someone who would use them to reverse the death sentence that Adam had introduced to mankind. Adam prophetically saw that a potential descendent of his to be born thousands of years later had not been allocated years and he sacrificed 70 of his own so that person would live. The recipient of those years was none other than King David, the scion of the messianic line which will usher in the end of time. Our tradition teaches that the Moshiach will help bring the world to its perfection and toward revival of the dead, reversing Adam’s colossal mistake. Adam knew this, and realized that it was critical for him to ensure that King David would live and accomplish his task in the world. Adam had brought death to the world, and to correct that, he ensured that there would be someone to bring us back to eternal life. By confronting our lower aspects and overcoming them, we can accomplish things that no angel can. The name Adam is therefore revealing. It describes our lower side, the tremendous downward pull and animal instinct within each of us. But it also alludes to our ability to become great — not in spite of our physical side but because of it and through our resisting its desires. By confronting our lower aspects and overcoming them, we can accomplish things that no angel can. Through our earthy nature, we are planted and have the opportunity to produce fruits through rising from the decay and becoming more than we were beforehand. The choice is ours. We can be governed by our blood impulses, as was Eisav in the Torah who killed when he did not get what he wanted and was therefore called Edom, red, alluding to his being controlled by blood instinct, or we can become stronger and loftier, remaining in control of our destinies as we always subjugate the dam in Adam to the aleph that precedes it. Upright posture distinguishes humans from other beings, and that characteristic reflects more than just an anatomical difference. Unlike other mammals which look naturally down and connect to only their instinctual and physical nature, humans stand up straight and look ahead. We can choose whether to look up, to grow from the ground, or look down, and sentence ourselves to a life dominated by our lower side. Each one of us is created in the image of God with unbelievable potential, and the name Adam alludes to the pitfalls we must avoid, and the tremendous growth we can experience.